This year it’s our 5th Anniversary! Exhibition "I Love My Planet"
Participants include: Artūrs Irbe, Vsevolods Zeļonijs, Ingrīda Amantova and others. The event presented by Raimonds Bergmanis!! Featuring groups: Morning After, Astro'n'out, BezPVN, Trakmēnes, Enas!! Project Footprints 2005 Final has passed! Thanks to everyone who came and participated!!! · special guests – a group „TUMSA”!!!! 24.30 Karaoke contest with the Grand Prix of Ls 50!!! Winners of the artistic contest I LOVE MY PLANET! Anita Alksne (LMA Student Club), Inese Saulaja („Mikrofona ieraksti”), Pēteris Goldbergs (Latvian Radio), Talivaldis Kronbergs (portal „StudentNet.lv”), chairman of the jury committee – Māris Žigats (Radio SWH). The spring of the musical union “Morning After” refers to late 2003, when 6 boys rich with creative ideas – Toms Rudzinskis (viola, saxophone), Nauris Kolmanis (tenor saxophone), Miķelis Studers (guitar), Jānis Olekšs (bass guitar), Māris Vitkus (keyboard instruments) and Edgars Runcis (drums) decided to experiment with jazz, funk un rock music elements. Soon to the band's instrumentals cast there joined also a vocalist Agate Dombrovska, whose fascinating quality of voice has become a part and a parcel of the band's sounding. Eventually in the music there also appeared traits of soul and disco rhythms. The musicians emphasize that it is morning when new ideas spring, consequently also opportunities to offer something that hasn't been offered yet. Therefore “morning after” is well known for ages and common. Romantic, energetic, passionate music and performance! During creative process that includes non-stopping experiments with musical instruments and voice, there come new melodies. Jazz, funk and rock ad lib might be considered as their music basic elements. The musicians continue traditions that have begun already in Latvia in these musical styles and offer their vision. For the first time the band was noticed at the contest arranged by the State 1 st Gymnasium „The First Record”, which enabled to start the way to SWH Hallway new bands top. As early as in summer 2004 the band made first appearance on the large stage, participating in various contests arranged in Latvia ( You have been noticed 2004, Mustard and Honey “Stage of Hopes” , Rumba Rock 2004 ). “Morning After” wasn't left unnoticed and won an award in the nomination „Audience's sympathy” ( You have been noticed 2004 ), also took an honorable 3 rd place ( Rumba Rock 2004 ). The contributed labor bears fruit and this year the band participated in the big contest of the festival „Mustard and Honey” , where took the 1 st place in the nominations: „The best pianist”, „The best blower” and „The best stage image”. Concurrently to study at a professional educational establishment young musicians actively perform in various Riga clubs ( LMA Students club, Spalvas pa gaisu, Kabata ), at festivals (“ Pictures 2004 and 2005”, “Under one roof 2004 and 2005”, “Bauzland 2004 ”, “Tabūns 2004” ), and also in private events. During recent half a year the band traveled in largest Latvian cities giving gigs within the tour SWH „Hallway”. This summer the band participated in a tour organized by NOKIA „Extreme tuss”, which visited Riga, Liepaya, Valmiera and Ventspils. The band was invited to participate also in the hottest event of this summer in Liepaya „Baltic Beach party 2005” at the concert on 22 July. 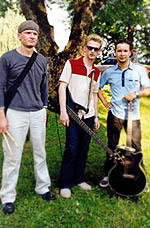 In the result of intense rehearsals in 2004 the band recorded its first single “First”, with which participated in the international contests “Priekšnams TV”. It is important to add that in Latvian clubs this single sounded also in gigs within the tour arranged by SWH „Hallway”. The band recorded a new single in September this year. The song “Call you” already within the first fortnight sweepingly stabilized its positions on the first place. It endured 3 weeks on SWH Hallway Top first place, also obtained rotation time in October over the airwaves of SWH and participated in SWH programs „Large Evening Concert” over the airwaves on 20 October this year. The largest achievement in the band's history is entering into SWH TOP 40, that is the first step that audience might recognize music created by Morning After. was won by the band from University of Latvia „Trakmēnes”! This band, which also might be called as a way of life, appeared thanks to coincidence of various circumstances. All members of the band previously performed in other musical teams, but at the end of the day they met and created a joint thing. Speaking about the name, it isn't accidental, but it has a deep word play, that might be difficult to make sense of at once. The band's music is penetrated with guitar music with rich emotions and as much as pensive lyrics, which skin-deep seem simple and may be a bit stale, but the band seems interested - whether audience can listen in or not. Trakmēnes is a very new musical union, appeared in late autumn 2005, but they were consolidating strength and ideas for much longer time. There have been performed just few concerts at local students parties, which the band considers as its target audience. As for its interim major achievement it considers getting through the semi-final of the concert „Project Footprints” and the obtained deserved „Audience's Sympathy”. Special prize to Deniss Hvostojs, a guy from the vocational school No.34. A competition of musical groups of higher educational establishments. Public Recognition Prize was awarded to Soundarcade, a group from the Banking Institution of Higher Education! The Jury Prize was awarded to The Briefing, a group from Liepaja Pedagogical Academy! We congratulate and wish further success to all winners and finalists!!! The jury: Maris Briezkalns (Latvia Radio), Māris Zigats (Radio SWH), Talivaldis Kronbergs (the editor of the portal “Studentnet”), Anita Alksne (the Student Club of Jazeps Vitols Latvian Academy of Music) and others. We are a group of three persons from Riga (initially 2/3 from Jelgava and 1/3 from Vangaži). The group consists of Artjoms Smirnovs called Archy (guitar, vocal), Sandis Grandovskis called Sandis (bass guitar, sometimes also vocal) and Ints Barkans called Inc (drums). Together we are playing only since February of 2002. Sandis and Archy have been strumming the guitar for about 4 years, when Sandis bought his first – Ukrainian – guitar. For the first two years, as all beginners, he was performing various proficiency exercises for fingers, trying to play pieces of Jimi Hendrix and Metallica. The last 1 ½ year we have devoted to creative work and we are playing our own music. The idea to found a group came up in the second half of 2001, but the process stretched a bit longer as we were not active in the search of a drummer. In January of 2002 we got acquainted with Ints, an ex-xylophonist, who was crazy about drums (we have to admit that he had not played drums a lot before). We decided to give it a try. Subsequently, this first attempt to play together can be regarded as the group's birthday – the 15 th of February. Since that day we are rehearsing regularly, and from time to time we have concerts in the clubs Depo, Saksofons, Zabadaks and elsewhere, we are participating in music festivals (“Sinepes un Medus”, “Uz Tukumu Pēc Smukuma”, “Tu Esi Pamanīts”, “Stage Nr.1”, “Liepājas Dzintars'03”, “Pēdas” etc.). Our first radio single F.T.W. was played on several radio stations and in some tops it reached the 1 st place (Radio NABA, Rietumu Radio), while in Radio SWH Top 40 it got the 4 th place and in SWH Rock – the 2 nd place. The history of the group's title is also interesting. It was spontaneous. The initial intention, even not an intention, but an idea created in hopelessness and despair, was to call ourselves “No-namers” as we could not come up with a name for a long time. After all, a group should not play without a name... In one of rehearsals the drummer Ints, when playing in his extremely loud manner, shouted out a question “What's the group's name?” At that moment he did not know about the idea of “no-namers”. The other three guys replied him but they were too silent. After stopping the drumming Ints calmy repeated, "No Neighbours?" Bingo!!!!!!! That's how the group's name was created. We think that it sounds well. The group "enas" (“shadows”) was founded on 13 November 1999. The group's composition has changed since its foundation. The age group is from 19 to 22 years. The group's name has originated from the title of the song "Shadows and Rain" played by the group "Odis". The group chose the short title of the song "Shadows" that in translation means "enas". In the first public appearances "enas" performed both its own and widely popular songs. At the end of 1999 the group's quality significantly improved as it changed its style of playing, made its own repertoire and performed in bigger and smaller events. Since 2000 the group "enas" has been giving concerts in Latvian clubs ("Cita Opera", "Kabata", "Grands", "Stikla pērlīšu spēle", "Multiklubs", the Students Club of the Latvian Academy of Music etc.). The presence and participation of the group is unquestionable in music festivals and competitions, as well as in miscellaneous events (Fishermen Days in Lapmezciems, LNT charity event, Christmas Party of the University of Latvia etc.). 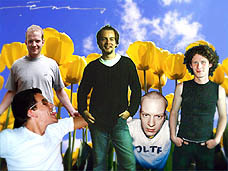 In spring of 2001 the group recorded two songs (in SWH records company): "She was so" and "Rainbow", which were a success in the festival "Roks pret militārismu" and the programme "Priekšnams" on Radio SWH. In spring of 2002 "enas" recorded its single "Candy" (SWH), released in CD format. "Radio SWH" interviewed the group "enas", on the same day the first video clip of "enas" was shot for the single "Candy". On the 1 st of October the group was on LTV 2, on the TV programme "Juniors TV". "enas" was recognised the best new group in September, their single "Candy" was included ion the TOP 40 of "Radio SWH" reaching the 16 th place. This song is still played on "Radio SWH" and other radio stations throughout Latvia. In summer of 2003 "enas" released a new song "Jo Tevis nav" that was noticed by several radio stations. In August this song was presented in the show of Egons Reiters on “Radio SWH” and currently several Latvian radio stations play it.